This Blog is a place where I share my own personal thoughts, notes, opinions and experiences with databases. I believe we together learn the new things by sharing knowledge. I hope you all will enjoy reading this blog. If you do have any question please let me know, I will try my best to answer you. I have 14 plus years experience as Solution Architect, DBA, Developer in SQL Server, MySQL, PostgreSQL, AWS Redshift, AWS Aurora, MariaDB, AWS RDS and cloud technologies.I love to share knowledge. Knowledge sharing is the best way to learn anything. I love to do programming whenever get a time. I have good knowledge in VB 6.0, .Net and Power Shell. 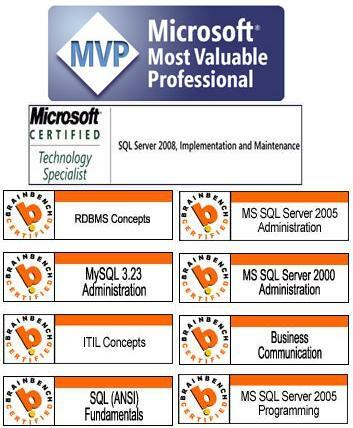 AWS Redshift and SQL Server I am subject matter expert. Could you please guide me on MySQL Certification? I m now in final year IT engg (2011-2012)from mumbai university..
Great position you are, and i also be like you, please gude and help me. srihari22187@gmail.com-This is my mail iD. Thanks SriHari.. Let me know what information you are looking for? I have eight years experience in windows system administration, now i plan to change my profile as SQL DBA, whats your opinion and from what version i need to start, currently what is the most used version between customer. can you send me the related book’s name which are useful to become a DBA. Hello sir,i am shayna student of btech i want to get certified in oracle ocp bt rite now i want training in oracle.can i get training in oracle within 1 month ? You have check for the institutes near by your location. Hello Jugal, Im from Canada but completly Non-IT background. I started my little step by doing a course in Software Testing and got certified from ISTQB. I want to become DBA or atleast i think that..!!! I need a mentor who could guide me through the path. Would you like to be my Mentor..?? Please guide me through the path of DBA..!! write your queries, i will guide you. can please suggests good books ,to get guidence while practicing below tasks as you mentioned in your PPT. Please configure powershell scripting and email notification for monitoring below. 2. Mirroring status on these instances. 3. Backup status on all instances. Note :output should be in html format.and email notification. can you help on this please. Sure, I can guide you for that. I got some tips from your blog. Thanks for it and will take help in future. I interested learn sql DBA. Can you tell me any once online training center . I would recommend to start with SQL DBA videos on youtube. Sir, I am working on MIS with Excel and MySQL .. My hobby is to work on data.. So please suggest me for DBA. I have done 6 months traing in .net as well but still not using. Sir, I am working with MIS excel and MYsql. My hobby is to work on data. and knowledge of C# as well . is it possible to go in DBA field. pls suggest . Yes, start with the DBA roles and responsibilities. Just now i dont my course SQL DBA 2012.. But in My Class Teacher teach me Full Theory Knowlege .. So i want particle knowledge SQL DBA 2012. So how can i improve this Knowlege . Thanku you for sharing knowledge.